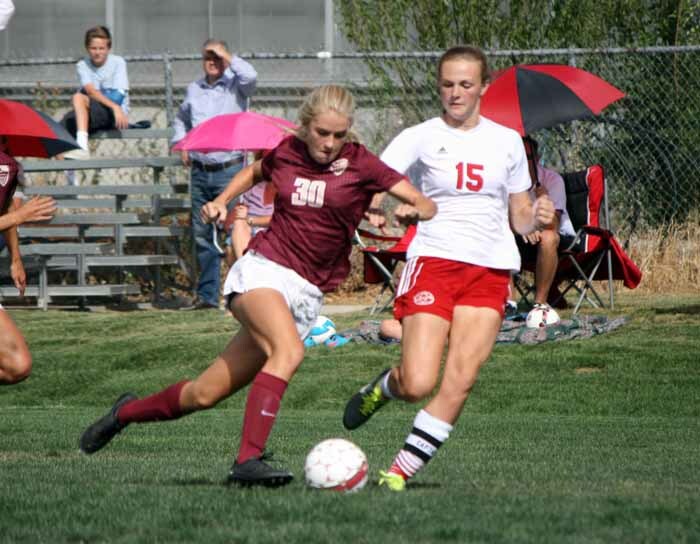 SPRINGVILLE – After controlling the flow of the game for most of the second half Thursday, the Maple Mountain High girls soccer team had to wait until nearly four minutes into extra time before closing out a road win at Springville. The Golden Eagles scored on a nice combination, an Ally Vaught pass setting up an Anna Pickering finish, early in overtime to claim a 3-2 win over their Region 8 rivals. Both teams moved the ball very well throughout the first half, and the constant back-and-forth midfield tussle kept both teams from getting a ton of great shots on goal. That started after Maple Mountain jumped out on top in the 12th minute. 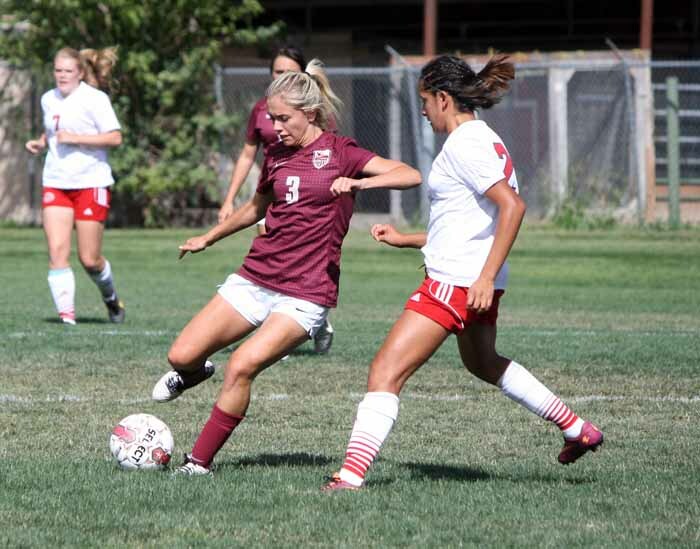 The build-up to the initial goal came right up the middle of the pitch, and then senior midfielder Erika Allred pushed a beautiful through-ball forward, splitting defenders, and onto the foot of senior midfielder Heather Asay. The pass set Asay up one-v-one on Springville goalkeeper Kayla Pexton and Asay beat the keeper for the 1-0 advantage. The teams went back and forth over the next 20 minutes, as the Red Devils sought the equalizing goal. Springville did a nice job building up toward the scoring area, but always seemed to fizzle when it needed that last pass. It was a pair of set pieces during the last seven minutes before intermission that finally allowed the Red Devils to crease the Maple Mountain net, not just once, but twice. The first goal came in the 33rd minute and was set up off of a long free kick by senior defender Alyssa Oman. The ball found its way into the six-yard box, where Springville took a number of shots on goal. Katelyn Walker and Anna Smith were both in the mix as one shot was turned away by Golden Eagle keeper Conlee Johnson and second rebounded off the crossbar before Amy Botcherby finished things off to level the score at 1-1. Four minutes later, the Red Devils took the lead as a flip throw-in by Samantha Hall set up an eventual left-footed score by Jensena Warren from about 15 yards out. That made the halftime score a 2-1 Springville lead. The second half took on a much different look than the first, as Maple Mountain turned up the pressure with its passing game, leaving the Red Devils mostly in counterpunch mode. The Golden Eagles put heavy pressure on the Springville goal, but Pexton came up huge. With sophomore midfielder Julia Dean, junior midfielder Brinley Nelson, Vaught and Pickering, a freshman forward, leading the charge, the Red Devil goalie had to deliver three diving saves to push balls wide of the frame. Those three saves all came in the first 15 minutes of the second half, and a fourth shot caromed off the crossbar. Five minutes later, the relentless pressure paid off as the Golden Eagles drew a foul on the goal line, just outside the penalty area. That set up sophomore defender Emma Card with a free kick that was essentially a short corner kick. The Card cross went into the area right in front of Pexton, but this time, freshman midfielder Ciena Woods got the touch to put the ball away into the back of the net. The match was tied 2-2. Pexton came up big once again in the 68th minute, when Nelson delivered a fantastic pass to senior Keana Bryan in point-blank range, headed toward the goal. Pexton saved Bryan’s blast to preserve the tie, at least for the moment. Late in the second half, in the 75th minute, another long Red Devil free kick put Maple Mountain in jeopardy once again. This time, as the ball bounced into a confusing mix about 10 yards out in front, Johnson slid through the bodies and covered the ball to keep Springville from getting a shot on goal. That was the last great scoring chance in regulation, and the teams went to overtime level at 2-2. Just seconds into the extra session, the Golden Eagles suffered a blow as Dean went down after suffering an apparent knee injury. Her teammates responded with more offensive pressure, and that was enough to deliver the win. In the fourth minute of extra time, Vaught possessed the ball to the left of the goal, just inside the penalty area. She saw Pickering making a run to the front of the goal and slipped her a pass at a spot about 10 yards out, with no one to contest the shot but Pexton. The freshman slotted the finish to the right of the keeper for the game-winner. An outburst followed, as the Red Devils called for an offside call on Pickering, but a Springville defender who was not involved in the play out to the left beyond the spot from which Vaught delivered the pass, was in position deeper than the attacking players, which kept the scorer in an on-side position at the time the pass was delivered. 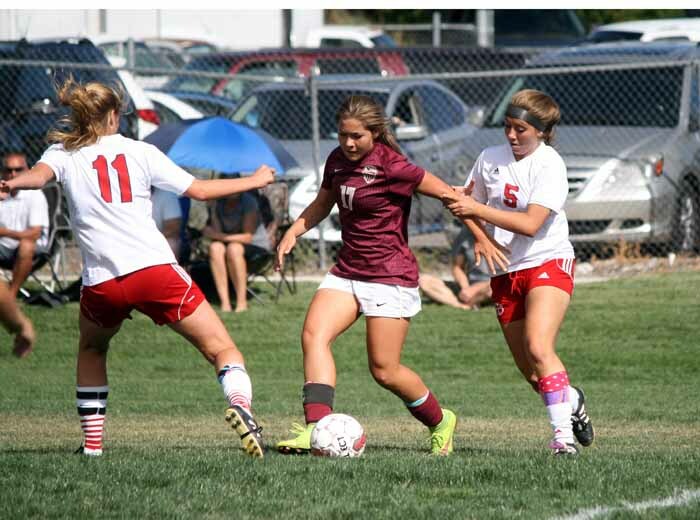 With the win, Maple Mountain (4-0 in Region 8, 5-3 overall) is in a commanding position in the league standings, with its closest pursuer, Wasatch (3-0-1, 6-0-2) coming to its place next on the schedule, at 4 p.m. Tuesday. Springville (2-1-1, 2-4-1) will visit Salem Hills (2-1, 7-1) Tuesday in a battle between two teams looking to maintain contact with the region front-runners.